Capt. Jim Lemke offers the best Tampa Bay Tarpon and Permit fishing on the west coast of Florida. It is perhaps the greatest thrill of all inshore angling in the world. These powerful fish flood the beaches off Tampa Bay every spring,, moving into the bay in the summer and remaining until fall. Of course there also are resident fish that remain year-around so while there are optimum times of the year to fish them, Tarpon are always an option in this part of the state. There are numerous ways to fish these amazing creatures and anglers can take their pick based on their skill level. The beauty of tarpon is that despite the huge challenge they present to expert anglers, they also are easily handled by beginners with the proper technique and the help of your guide Capt. Jim Lemke. 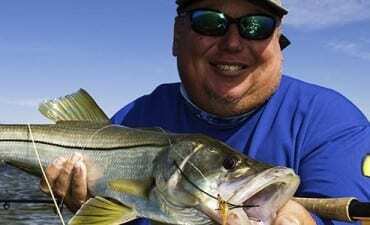 Tampa Bay is the secret fishing hole for Tarpon. It’s like Las Vegas, it turns on at night, and night fishing for tarpon under the bridges around Tampa really turns on through late spring, summer and fall. This is without a doubt your best chance to catch your first tarpon, or a trophy silver king to remember for a lifetime. Period. Fish over 100lbs are common- see the photo gallery on this site. And remember, we measure these fish here in feet, not inches.